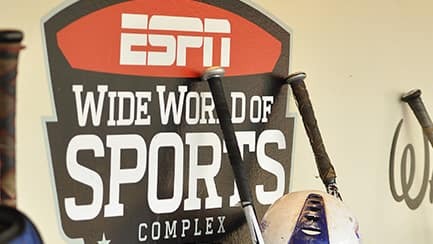 ESPN Wide World of Sports Complex welcomes youth baseball teams from around the world! 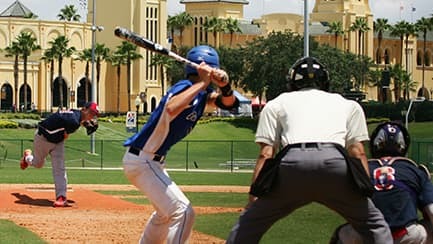 Located at Walt Disney World Resort in Florida, this world-class venue brings together athletes of all ages and skill levels to celebrate America's national pastime with special events—from youth tournaments to the Atlanta Braves Spring Training. Here, young athletes can play where the pros play, and hone their skills year-round through tournaments and training programs. 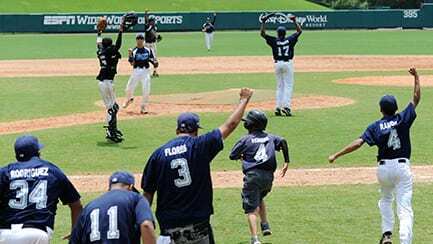 Bring your team to the next level with Disney baseball tournaments at ESPN Wide World of Sports Complex. Choose from holiday and summer tournaments that offer high-quality competition along with thrilling Disney experiences. Celebrate the fourth of July with a fun-filled baseball tournament at Walt Disney World Resort! Celebrate the fourth of July with a fun-filled baseball tournament at Walt Disney World Resort! During the Disney International Salute to Baseball tournament, teams from around the world gather for a fun-filled competition—with athletes coming from Canada, Panama, the Dominican Republic and beyond. Take advantage of specially-priced Walt Disney World Resort packages for this event, with options starting from $597 per person and includes. 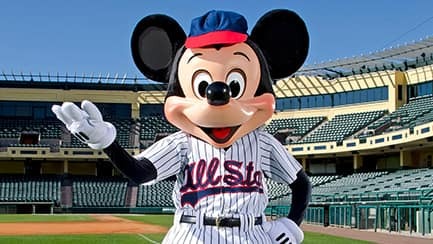 To get started, contact the Disney Baseball Office. Call (407) 938-3802 or email us. Kick off the summer with a thrilling baseball tournament over Memorial Day weekend. Kick off the summer with a thrilling baseball tournament over Memorial Day weekend. 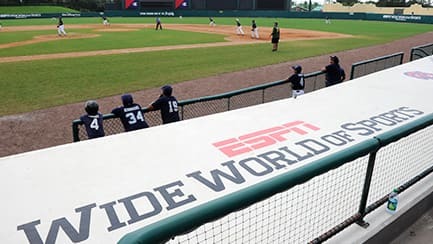 This tournament brings together youth baseball teams from near and far for a thrilling competition with ESPN entertainment. Enjoy one last tournament with your summer baseball team before fall officially begins. Enjoy one last tournament with your summer baseball team before fall officially begins. Formerly known as Disney Turn Back the Clock Weekend, the Disney Labor Day Baseball Classic gives teams an opportunity to extend their season and enjoy some international competition. End the year with a little magic and a lot of baseball—and then ring in the new year! End the year with a little magic and a lot of baseball—and then ring in the new year! During the Disney New Year's Baseball Classic, teams gather for a fun-filled competition—and an unforgettable year-end celebration. To participate in this tournament, competitors must book a Disney Resort hotel through Anthony Travel. Specially priced theme park tickets are available. Disney brings together top teams from around the world to compete in professional-quality competition venues at ESPN Wide World of Sports Complex. Discover professional-caliber facilities at ESPN Wide World of Sports Complex. Discover professional-caliber facilities at ESPN Wide World of Sports Complex. Throughout the year, it hosts numerous amateur and professional sporting events across 10 world-class venues, delighting participants and fans alike. Champion® Stadium: Home of Atlanta Braves Spring Training and youth tournaments, this stadium features 9,500 seats, 4 luxury sky boxes, and multiple open-air suites and patios. Baseball Quadraplex: Available for more advanced tournament play, this venue is located near Champion® Stadium. It features 4 professional-size fields (2 equipped with lights for night play) and one practice infield. MARATHON® Sports Fields: This versatile area features 4 fields that are configured for baseball during tournament play. Diamondplex Fields: These 6 fields are well-appointed to accommodate tournament play—and are equipped with lights and batting cages. 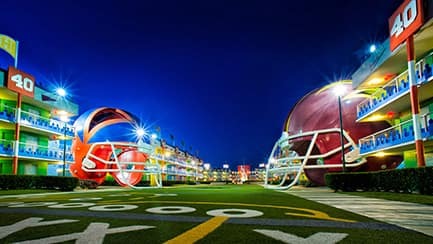 While at ESPN Wide World of Sports Complex, you can visit the Welcome Center for assistance with your team's travel needs, including theme park tickets, dining, transportation, directions and more. Enjoy access to helpful amenities and team travel solutions. Transportation Services: You can arrange for special transportation for your event. Plus, when you stay at a Disney Resort hotel, you can take advantage of complimentary transportation throughout Walt Disney World Resort. 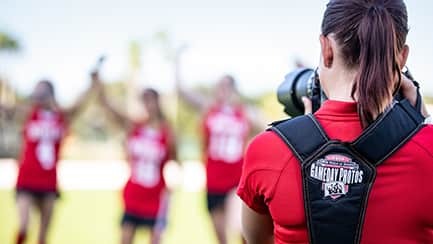 Photo Services: With Gameday Photo Service, you never have to miss a moment of the competition. And while at the theme parks, Disney PhotoPass photographers can capture special moments for you—and get everyone in the picture. Dining: Have freshly prepared and packaged meals delivered to your field, or sit down for a team meal at ESPN Wide World of Sports Grill. Plus, discover a wide variety of dining options throughout Walt Disney World Resort. Learn more about our convenient services and amenities. Walk in the footsteps of top athletes, and play ball on the very same fields. Each year, the Atlanta Braves return to ESPN Wide World of Sports Complex for their annual Spring Training. They play at Champion® Stadium—which is where your team can compete during a Disney baseball tournament. ESPN Wide World of Sports welcomes the Baseball Canada National Team as they participate in training sessions and games during their Fall Training. As a speed and agility coach for the New England Patriots, Coach Tom Shaw helped his team earn 3 NFL championship rings. Today, he continues to train NFL players and NCAA football players at his Performance Enhancement Camp, located at ESPN Wide World of Sports Complex. Experience Walt Disney World Resort the way you want—both before and after your team competes. Disney makes travel easy with comprehensive packages, special transportation, planning tools and more. Choose from Disney Resort hotels that put you in the middle of the magic. Choose from Disney Resort hotels that put you in the middle of the magic. Enjoy convenient proximity to the theme parks, water parks and ESPN Wide World of Sports Complex. My Disney Experience: Enjoy access to online and mobile tools that make it easy to dream, plan and share your vacation details—both at home and on the go. You can connect to everyone in your travel group by adding them to your Family & Friends list first. You'll be ready to make and share plans together—including FastPass+ selections. Early Access to Disney FastPass+ Planning: Get first access to reserve some Disney FastPass+ attractions, shows and more—up to 60 days before you arrive! Complimentary MagicBands: These lightweight, flexible wristbands allow you to effortlessly access the plans and vacation choices that you've made with My Disney Experience. Extra Magic Hours: Each day, one of the parks offers extended hours, so you can enjoy select attractions (valid park admission and Resort ID required). Complimentary Resort Transportation & Parking: Motor coaches, ferryboats and our world-famous monorail make getting around Walt Disney World Resort convenient! Plus, enjoy complimentary parking at all theme parks and Resort hotels. Complimentary Airport Transfers: Take advantage of complimentary motor coach transportation between Orlando International Airport and your Disney Resort hotel via Disney's Magical Express service. Entertaining Amenities: Themed pools with slides, outdoor Disney movie screenings and Character Dining experiences are just a few of the fun activities that are available at select Disney Resort hotels. Learn more about the benefits of staying at a Disney Resort hotel. 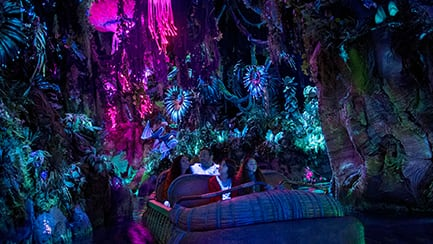 Now's a terrific time to visit, with new additions at Walt Disney World Resort! With so much to see and do, it's easy to return to Walt Disney World Resort year after year—and find even more to explore. Make the most of your stay—and discover fun for everyone. Make the most of your stay—and discover fun for everyone. From high-flying thrills to spectacular fireworks displays to enchanting encounters with Disney Characters, Walt Disney World Resort offers experiences that will excite and delight—whether you're a kid or simply a kid at heart. Learn more about Walt Disney World Resort.